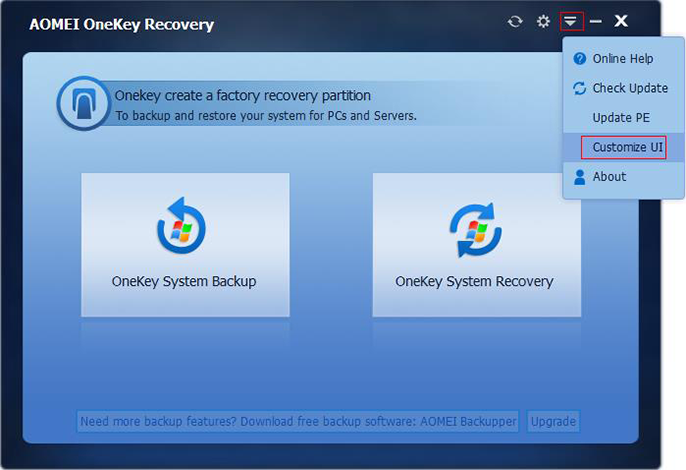 Since AOMEI OneKey Recovery 1.5 released, it added a new feature - AOMEI OneKey Recovery’s UI Customization Tool. 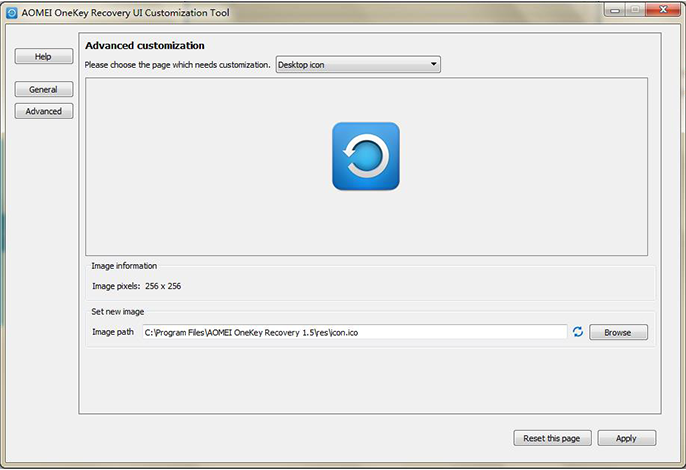 With it, you can change the software’s logo, GUI as you wish and freely. 1. 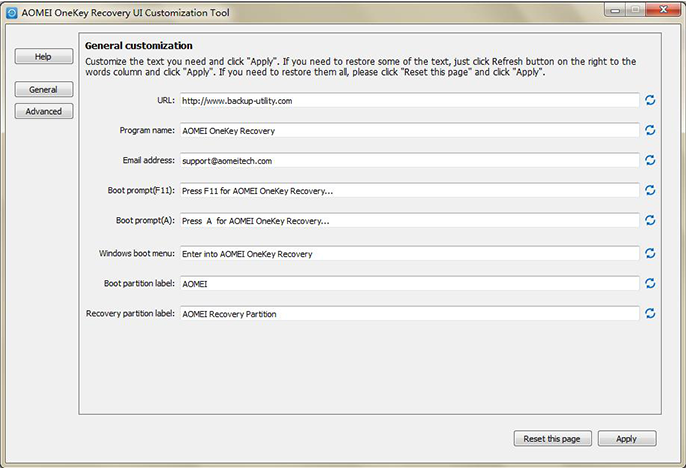 Run AOMEI OneKey Recovery and select Customize UI. 2. Read Help document before making changes. 3. General customization allows you change the URL, name, contact email, boot prompt(F11) text, boot prompt(A) text, Windows boot menu text, boot partition label and recovery partition label. 4. Advanced customization allows you change the desktop icon, program icon, launch interface, main interface backup and restore button, main interface background image, dialog box background image, main interface text background and setting dialog box background. 5. Click Apply to save these changes. Customization with this built-in tool won’t remove the sentence "Copyright © 2009-2015 AOMEI Tech. All Rights Reserved" in ABOUT window. 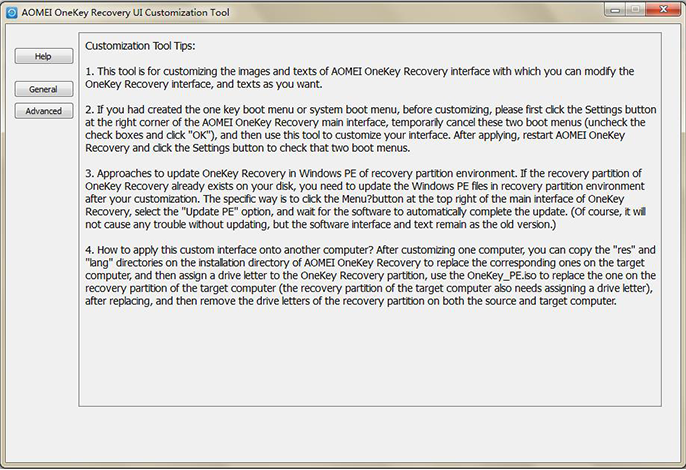 If this AOMEI OneKey Recovery’s UI Customization Tool still can’t satisfy your needs or you have other suggestions, please feel free to write to us, thanks.